The BDC-1 and the BDC-2 scale systems are designed to weigh and fill 1 to 20 lbs. of non-free flowing moist products like diced tomatoes, coleslaw, fresh-cut potatoes, cooked pasta, diced fresh ham and similar products. The BDC uses bulk and dribble belts to fill the product into the weigh bucket utilizing multiple set points to ensure a fast yet accurate fill. A product leveler is used to control the depth of the product feeding into the weigh bucket and a flap gate closes after the target weight has been met keeping extra product from falling in. 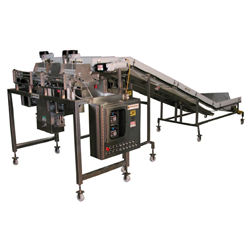 A form fitting push plate is used to cleanly sweeps the portioned product from the weigh bucket into the package (single and double discharge options available). Whether you process product in a continuous or batching mode, there is an appropriate infeed system offering optimal product delivery to the scale head(s). 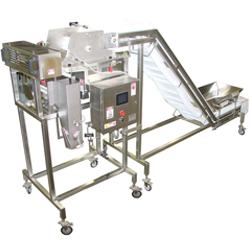 The BDC Series can interface with a vertical bagger, pouch bagger or container indexing conveyor and is available in single or double discharge designs. Chose from below to find the right scale for your needs.